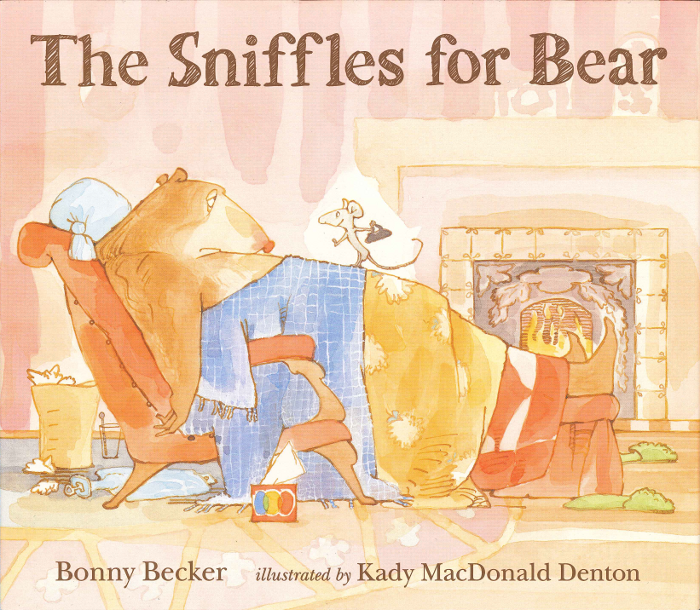 Bill, our BLG reader this week read us the very funny The Sniffles for Bear written by Bonny Becker and illustrated by Kady MacDonald Denton. Oh, poor, poor Bear! He has a terrible, terrible cold – quite possibly the worst in existence of the world he is convinced! (Bear is quite the “Drama King” we quickly realized). When Mouse arrives at the door ready to help, Bear is suspicious of his cheerful demeanour. Mouse starts to read aloud and Bear insists he stop, “I fear you do not appreciate the gravity of my situation.” Mouse changes tactics and decides to serenade Bear with a soothing version of “She’ll be coming around the Mountain.” Bear complains. No, no, no! He needs mournful songs. Mouse pulls out his banjo. “This is impossible, intolerable!” Bear exclaims. And on it goes. Mouse tries his best to comfort poor Bear. He drags him up the stairs, tucks him into bed and serves him nettle soup (which Bear thinks tastes like spinach and straw). But Bear is still dreadfully and dramatically ill! There is will dictation (“I leave my red roller skates to . . .”), some dramatic shouting and finally . . . sleep. When Bear awakes, it is his turn to play nurse. : ) This is a giggle inducing book! We have been learning about different genres and one student pointed out that it should go into the humour basket. “No right to the giggles section!” called out someone else. Raymond: It was funny when the mouse sang. “Ooooooh she’ll be coming round the mountain when she comes She’ll be coming around the mountain when she comes.” And I liked when the mouse pulled the bear up the stairs. 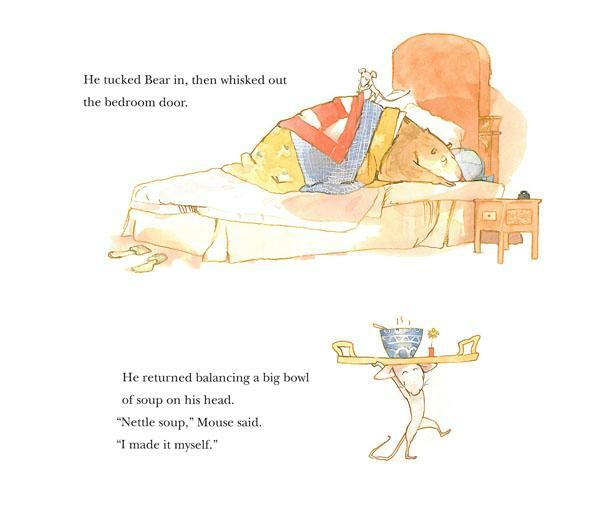 Truman: I like the part when bear asked mouse (shaking his trembling hand) to get him to bed. Carmen: I liked the part when mouse went into bear’s house because he was sick. then mouse took out a yellow book and sang, “Ooooh she’ll be coming round the mountain when she comes. She’ll be coming . . ” “Disgraceful!” said Bear. This entry was posted in BLG Reads this week and tagged BLG Reads, Bonny Becker, favourite illustrators, fiction, friendship, great read alouds, Kady MacDonald Denton, picture books by carriegelson. Bookmark the permalink.